Local historian Florence Petersen has been quietly working away on her book on Whistler’s pioneers for the last three years and with the help of the Whistler Museum, she hopes to get it published in the next few months. There’s only one problem…. it doesn’t have a name! 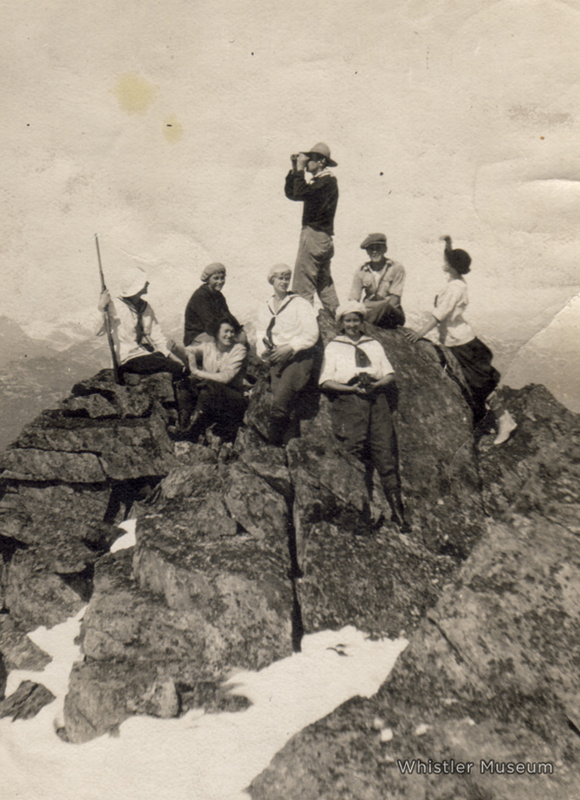 Whistler’s pioneers searching for a good name. The book tells the story of Whistler before skiing came to the valley. Myrtle Philip and Rainbow Lodge are of course featured, but there are many other early residents whose tales are told here, including trappers, loggers, prospectors and summer cottage owners. It covers the period from about 1900 to 1965, the year the ski-hill was built. The book can’t be published without a title, so we are running a competition in the hope that you lovely people in internet-land might be able to help us out. If you have a good idea for a title then we would love to hear it. If we select your title you’ll win a free museum membership and a copy of the book signed by the author, and, of course, the GLORY of naming a book! Closing date for entries is March 1st. This entry was posted in Beyond Skiing, Characters and tagged history, local history, pioneer, Whistler, Whistler Museum, Whistory. Bookmark the permalink.